With Pirates’ Day being tomorrow, I wondered if perhaps I could get away with posting a pirate outfit for the first Batinna’s Dress Up theme, “poor”. Most pirates — especially cursed ghost pirates — are more of the “poor unfortunate souls” type than the bandit king or queen type. When I checked the list again, however, there was “pirate” as a separate — and the second — theme. Having just made new Transmogrification kits for all my Mages, I poked around for items that seemed patched, torn, or frayed in the wardrobes of a few other characters who haven’t had an oufit update recently. 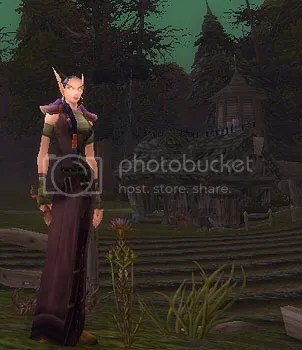 I found these things in my Warlock’s closets, and a quick trip to Tirisfal Glades yielded the staff. She was too poor to afford the Transmogrification and Barbershop fees for the new look herself. My richest character on her server had to send her a bit of gold. /scratches head I dunno if it’s one too many years of being PC or what, but the “Poor” theme made me uncomfortable, so I decided to skip it. It took me awhile to decide to do this challenge because I was struggling with that first theme, too. I’ve tended to get rid of the patched, frayed, and torn looking clothes that one gets as a lowbie as fast as I can and to avoid such styles in general. Although my “Wise Woman” set from Mog Madness would have fit the “poor” theme, I didn’t want to just re-use a set I’d already made for something else. 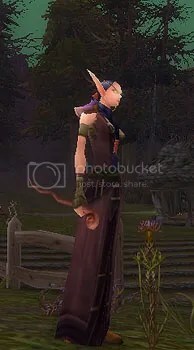 My Gnome Mage has a couple of very impoverished-looking robes — but, as I said, I’d *just barely* made her a new set and didn’t want to change her again quite so soon. The name of theme #8 makes me uncomfortable — I think I’ll rename it to “bling” when I make & post an outfit for it. She looks like a royal fallen on hard times. The well-made clothes now a bit tattered and shiny in spots but she holds her head high and goes on, after all she’s a Warlock. Yes, I know you can tell I’m a Warlock lover, lol. Fallen on hard times, indeed. That, or she is hiding from the tax man! Hee hee, hiding from the tax man, I like that!